Bruce Power and the Independent Electricity System Operator (IESO) have entered into an amended, long-term agreement to secure 6,300 megawatts of electricity from the Bruce Power site, through a multi-year investment program. In 2005, Bruce Power entered into the Bruce Power Refurbishment Implementation Agreement (BPRIA) to enable the restart of Bruce Units 1 and 2, to return the site to its full operating capacity of eight units. The amended agreement entered into today will enable the company to progress with a series of incremental life-extension investments, including refurbishment, to secure a clean, reliable and affordable source of electricity for Ontario families and businesses for decades to come, as outlined in Ontario’s 2013 Long-Term Energy Plan (LTEP). That begins Bruce Power's release on the agreement. Transcanada Corporation, owner of nearly half of Bruce Power, has also issued an informative news release. In April I'd written on the pace of the negotiations, and some issues related to refurbishment scheduling. This agreement, it seems to me, recognizes the value of Bruce Power's initiatives in extending the pre-refurbishment life of the reactors. The amended agreement, which will take economic effect January 1, 2016, will allow Bruce Power to immediately invest in life extension activities for Units 3 through 8 to support the long-term refurbishment program. This early investment in the Asset Management (AM) program will result in near-term life extension, allowing later investment in the Major Component Replacement (MCR) work that will begin in 2020. Gone from the refurbishment schedule etched out in Ontario's 2013 Long-Term Energy Plan are full refurbishments -now dubbed Major Component Replacement (MCR) - that displayed Bruce 4 entering refurbishment in the third quarter of 2016, and and Bruce 3 30 months later. Bruce Power advises " a long-term refurbishment program that will commence on Unit 6 in 2020," confirming improved confidence in the pre-refurbishment life extension "asset management (AM)" undertaken on units 3 and 4.. The refurbishment schedule begins 4 years later than the LTEP planned, and refurbished units are anticipated to also operate longer. The refurbishment of each unit will add approximately 30 to 35 years of operational life, while other life-extension investments will add a combined 30 reactor years of operational life to the units, pre-refurbishment. This approach provides additional benefit in terms of sequencing refurbishments and optimizing asset life. The Bruce A and Bruce B distinction disappears in terms of ownership and the contract with the government. 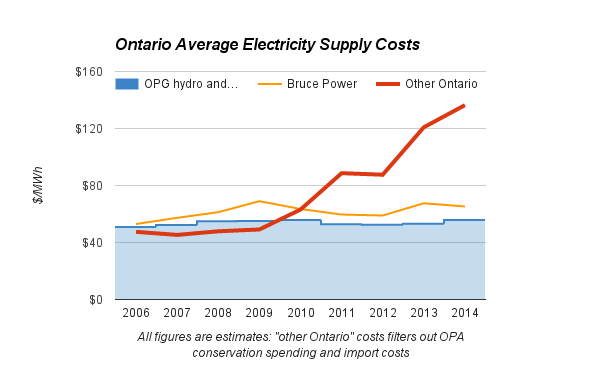 The regulated price plans under which most Ontario ratepayers are billed begins 2016 at $107/MWh - 62% higher than the output from Bruce Power will be procured at. Bruce Power's output has been increasingly more attractive, financially, than other Ontario generation, Historically the public generator, Ontario Power Generation (OPG) has been the province's low-cost power provider, but with a slew of increases introduced over the past 15 months, their 3rd quarter report showed their average revenue at 7.1 cents/kilowatt-hour, making it likely that in 2015 Bruce will attain the title of Ontario's low-cost generator for the first time. Today's announcement is one contract I applaud.